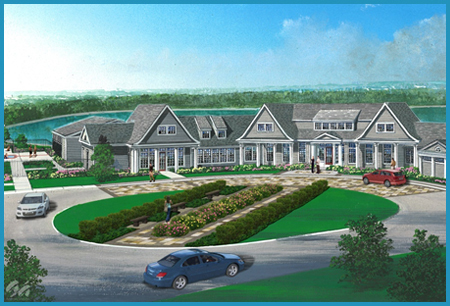 The Villages at Two Rivers project is being developed as an active adult community on approximately 1,469 acres of wooded land in the Odenton area of western Anne Arundel County, Maryland. The project is proposed to include 2,060 residential units, of which 1,369 are expected to be single family detached homes priced in the $450,000 to $650,000 range and approximately 691 are expected to be single family attached homes prices in the $350,000 to $495,000 range. The development, located approximately 15 miles northwest of Annapolis, 24 miles northeast of Washington, D.C., 25 miles south of Baltimore, and seven miles southwest of Fort Meade, is proposed to include lifestyle amenities, including, but not limited to, a community center, clubhouse and pool. Upon completion, it is expected that Villages at Two Rivers will generate expected taxable value of over $323 million. The project met county goals of providing new quality housing to retain and attract residents 55 and older. Retirees provide significant economic benefits and many Maryland retirees relocate to other states, costing the state and county these economic benefits. The property was well suited for the proposed development; however, developing the property was challenging, as it required the reclamation of three previous sand and gravel mine areas and significant public infrastructure. The economic benefits of a retiree community, and county goal of retaining retirees, along with the challenges of developing the property, justified county participation with the financing of public infrastructure through the issuance of special tax bonds. Special tax financing was instrumental in making this major economic development and retiree retention project a reality in Anne Arundel County. In 2014, Anne Arundel County issued Special Taxing District Bonds in the amount of $30,000,000 to finance public infrastructure, including, roads, a water tower, three sanitary sewer pumping stations, and sanitary sewer and water trunk lines. Security for the bonds is solely in the form of special taxes levied on the property within the Villages at Two Rivers. Prior to the issuance of bonds, MuniCap, Inc. served as the financial consultant to the developer, preparing the special tax plan of finance, feasibility analysis, and rate and method of apportionment of special taxes. Once bonds were issued, MuniCap, Inc. transitioned into the role of administrator to the Villages at Two Rivers Special Taxing District. As administrator, MuniCap, Inc. ensures compliance with the Securities Exchange Commission and Internal Revenue Service regulations by preparing the required reports and documents. Additionally, MuniCap assists Anne Arundel County in determining the special taxes to be collected each year.